Blaze Manufacturing Solutions is a leading provider of fire safety protection and loss prevention solutions such as the Flameshield flexible piping system, fire system valves, foam systems and deluge skids. Experienced in all types of fire protection systems on numerous installations and facilities both on and offshore, a number of complementary products and services are also provided. Blaze has pioneered the development of the innovative Flameshield 300 Flexible piping system as an alternative to traditional hard pipe systems. It offers a jet fire and blast-resistant, corrosion-resilient fire protection product. With a 25-year design life it can eradicate corrosion problems for the remaining platform life. Installation can be achieved without hot work or having to shut down the platform. The Civil Aviation Authority (CAA) amended regulation CAP 437 to require new Normally Unmanned Installations (NUIs) be constructed with Deck Integrated Fire Fighting Systems (DIFFS). Existing NUIs are required to have systems retrofitted. DIFFS typically consist of a series of ‘pop-up’ nozzles, designed to provide an effective spray distribution of foam to the whole of helicopter landing area. Blaze can provide compliant systems, and in addition to DIFFS we can provide Compressed Air Foam Systems (CAFS) offering superior fire suppression qualities over standard foam systems. AutoCAD Inventor Design Suite and BlazeShield Professional 3D CAD software solutions are used to deliver 3D product design. This allows visualization of the design before the system is built by using digital representations of the end product. Extended capabilities such as automated bill of materials minimise errors and maximise productivity, enabling cost reductions to be realised. Hydraulic analysis of all system designs are undertaken within Pipenet Vision Steady & Transient state software integrated with Caesar to optimise the piping network and determine the pipe stress input. Blaze can create custom designs, enabling the client to inspect and ‘walk through’ the proposed design from all angles. 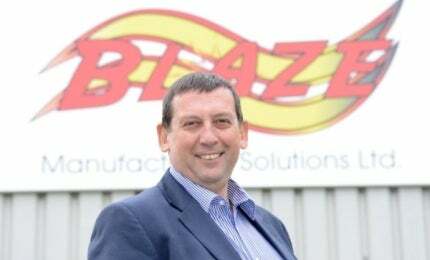 Blaze offer a full range of skid build and factory acceptance testing in-house. Blaze can provide a simple solution for the removal of corrosion and scale build up from blocked deluge systems. Using UK manufactured environmentally friendly chemicals, Blaze can return blocked systems back to operable status without damaging bare metals, seals or valves. Blaze can provide low and high-pressure water mist systems and gaseous systems. CO2, FM200, Novec 1230, Inergen or Argonite, Blaze covers the complete range of gaseous systems. These systems can complement the suppression systems offered by Blaze or can be used on their own to provide early warning of a fire condition. When used alongside conventional smoke detectors they can be used to provide a coincidence signal requiring both systems to detect a fire before the extinguishing system is released. Enclosures fitted with a fire suppression system must be able to contain the fire suppression agent at the highest level for 10min following a discharge to prevent re-ignition. Blaze can carry out annual integrity testing in accordance with the requirements of BS ISO 14520:2006. Blaze can provide small fire and gas systems to large-scale, PLC-based detection and control systems. PLC-based systems are designed to meet the requirements of IEC 61508 and are capable of achieving a Safety Integrity Level of 3. They can be configured to integrate fire and gas detection and extinguishing control and can be supplied suitable for use within a Zone 1 hazardous area. Blaze engineers are competent and experienced in building planned maintenance programmes for safety critical systems. By applying inspection frequencies together with hourly allocations, complete planned maintenance schedules can be realised. Quality and service are key factors in the industry, and Blaze has formal approvals from internationally recognised bodies, including ISO 9001, ISO 14001, and OHSAS 18001 environmental and occupational safety approval. Blaze is also a member of first point assessment. Blaze Manufacturing Solutions was established in 2006 to offer a complete supply and service solution for the industry. Blaze predominantly operates in the oil and gas sector and has since extended its services into the renewable energy and decommissioning markets. The company works with major names in the industry, including Perenco, Enquest, Apache and Taqa. An award-winning specialist north-east oil and gas industry fire safety protection company has won three major contracts totalling a combined seven-figure sum. The finance director of a leading UK specialist oil and gas industry fire safety protection firm is getting set to share the story of her entrepreneurial success during an event for businesses from across Aberdeen City and Shire. An Aberdeenshire specialist oil and gas industry fire safety protection company has made a series of key appointments to meet demand from clients. An award-winning UK specialist oil and gas industry fire safety protection company has reached the finals of prestigious business awards in recognition of its commitment to work in the oil and gas industry. A dedicated employee from an award-winning specialist oil and gas industry fire safety protection company is stepping down after almost a decade. An award-winning specialist oil and gas industry fire safety protection company based in the north-east of the UK is celebrating after reaching the final stages of the Elevator Awards 2015. An award-winning specialist oil and gas industry fire safety protection company in the UK has reported a successful start to the year after securing a number of contracts valued at circa £2m.